The President of India, Pranab Mukherjee, said the role of Russian soldiers and civilians changed the course of World War II, its outcome and the future of the world. He gave an exclusive interview to TASS First Deputy Director General Mikhail Gusman on the eve of his visit to Russia from May 7 to 11, 2015. 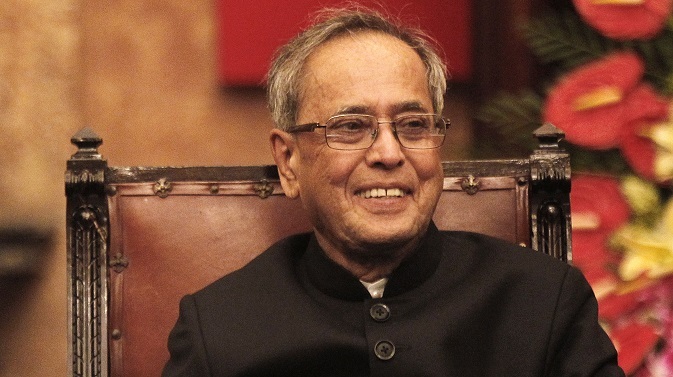 The Indian President, who is visiting Moscow from May 7 to 11, to participate in celebrations related to the 70th anniversary of the victory over fascism, said it would be an honour to be part of the commemoration of the 70th anniversary of World War II which recognizes the monumental contributions of Russia to the victory over Nazism and Fascism. He was very happy an Indian Military contingent will be part of the Victory Day parade for the very first time. The commemoration reminds us of the need for all countries to strive actively for peace, for the common benefit of humankind and to never forget lessons of the War. Mr. President, we are meeting on the eve of your visit to Russia to celebrate the 70th anniversary of the Great Victory. What value do you place on this meeting? What are the feelings you are going to Moscow with? World War II, or the Great Patriotic War as it is known in Russia, was one of the determining events of the 20th Century. Indeed, of human history. The role of Russian soldiers and civilians changed the course of the war, its outcome and the future of the world. But this was achieved at the cost of tremendous suffering on the part of the Soviet people and the Russian nation. We recall with deep respect the millions who lost their lives during the War. Tens of thousands of Indian soldiers also sacrificed their lives in the war. I visited Moscow for the commemoration of the 50th anniversary in 1995 and I remember the solemn fervor of the event. It will be an honour to be part of the commemoration of the 70th anniversary, to recognize the monumental contributions of Russia to the victory over Nazism and Fascism. I am very happy an Indian military contingent will be part of the Victory Day parade for the very first time. The commemoration also reminds us of the need for all countries to strive actively for peace, for the common benefit of humankind and to never forget lessons of the War. You have already met Russian President Vladimir Putin. How does your communication go? I have had the pleasure of a long association with Russia and its leadership during my many decades in public life. It has been my privilege to meet President Putin on a number of occasions. I hosted him late last year in New Delhi when he visited India for our Annual Summit. We had a warm conversation on the vibrancy of India-Russia relations, to which he has made a major contribution. We discussed the initiatives currently underway to further strengthen our bilateral partnership. At our forthcoming meeting in Moscow, I hope to continue our conversations on these matters and on international developments of interest to both our countries. Relations between India and Russia have long and rich history. At the end of the nineteenth century, the future Emperor Nicholas II, who visited India during the global cruise, expressed interest in opening a Russian consulate in Bombay. Relations between our countries have never been marred with wars or conflicts. How do you assess the dynamics of the relations between our countries? Contacts between India and Russia go back several centuries, even before the visit of Tsarevich Nikolai to India in 1890-91. Geopolitical realities and cultural affinities have ensured that ours has been a relationship marked by exceptional understanding and convergence of views, through all the realignments in the global political and economic landscape. Russia was the first country with which India concluded a formal agreement on strategic partnership in October 2000. In recognition of the considerable strengthening of our multi-faceted relations since then, we now describe our relationship aptly as a special and privileged strategic partnership. As the bilateral relations were developing dynamically they have acquired a comprehensive strategic partnership character. Russia and India have made substantial progress in cooperation in various fields: economic, trade, investment, energy, military-technical, science, education and culture. It is no exaggeration to say that there are almost no areas where our countries have not developed close ties. I know that due to your efforts the volume of trade between India and Russia has increased. What areas of our bilateral cooperation in your opinion are most successful, and which still have untapped potential? As you say, our bilateral relations cover virtually every field of human endeavour. In recent years, we have made significant progress in our cooperation in defence and nuclear energy. At the same time, there is still considerable untapped potential for further strengthening our partnership. At the recent Summit meeting, we identified initiatives to take our economic relations to a significantly higher level. We will be encouraging closer contacts between regions of our two countries to give further impetus in this direction. We are also re-invigorating our cooperation in Space. An area of considerable promise is cooperation in education, research and innovation. We are actively working towards creating institutional linkages between our educational and research institutions. What is your opinion on the potential and prospects of cooperation between Russia and India in the sphere of nuclear energy, fuel and energy complex? Nuclear energy is an important component of India’s energy security strategy. We deeply value our exchanges with Russia in nuclear energy. The multi-phase Kudankulam project showcases the outcome of our cooperation. Last December, our two countries set out a strategic vision for further development of our cooperation. We are aware that the hydrocarbons sector holds great promise. During President Putin’s visit, we agreed to set an ambitious agenda for partnership in oil and natural gas. This includes broader collaboration between our hydrocarbon companies in exploration and production, as well as in LNG projects and supplies. The Russian Federation and the Republic of India cooperate in military and technical field for already more than fifty years, and this cooperation traditionally has large-scale character. In recent years this cooperation is moving from simple relations of “buyer and seller” to multifaceted partnership in developing new technologies and modernizing weapons. How do you assess the results of interaction in this sphere and perspectives of cooperation? You have rightly pointed out that our military-technical cooperation is built on a strong foundation. It now includes joint research, design, development and production of advanced defence systems. The BrahMos supersonic missile project is a vivid illustration. We would like to apply this experience to other defence platforms and equipment. We believe that the Make in India initiative provides exciting new opportunities for India-Russia collaboration in setting up manufacturing facilities in India for Russian weapons systems, their sub-assemblies and components. We had discussed this with President Putin, who responded very warmly to this approach. We are also putting in place more active service-to-service exchanges, training cooperation and regular military exercises. Moscow and Delhi views on most modern problems in external policy are very similar or tie together; in particular, our countries stand for a multipolar world where national interests of all countries and nations are considered. In addition to bilateral cooperation Russia and India are very actively developing ties and contacts within the framework of international and regional organizations, such as the UN, the BRICS, and the SCO. How do you assess our cooperation in this area? Our relationship with Russia covers a wide canvas, including cooperation in multilateral fora and consultations on global security issues and regional developments. On all of these, we have similar perspectives. The threat of terrorism in our shared neighbourhood is a matter of common concern. We work together in G-20 and BRICS to promote our shared interests. We look forward to Russia steering BRICS as its chairman this year. India has also been participating in the activities of the Shanghai Cooperation Organization as an Observer.